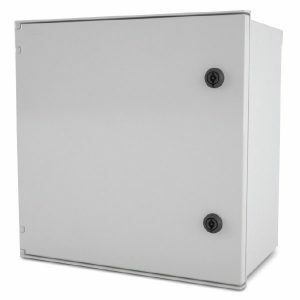 Endurance (E) Series enclosures represent a next generation in enclosure evolution: a double insulated body that can be mounted directly to the wall or rail with no external feet or flange. In this design, mounting bolts are completely isolated from the interior of the enclosure, maintaining complete environmental integrity inside with maximum electrical safety. These fiberglass-reinforced polyester enclosures feature a flush, removable, hinged door with 180º opening. There are 8 sizes of Endurance Series enclosures to meet the broadest industrial needs. The enclosures are rated watertight, self-extinguishing, with a broad temperature range. Raised bosses internally provide for an extensive range of panel mounting options or DIN rail. They are easy to machine as well as customize to the user’s demanding specification. Endurance Series enclosures were designed with an end user hinge pin system that makes replacing doors very easy. This provides full access to the interior of the enclosure in addition to cutting, drilling or machining custom facings on the door itself.